This plug-in queries a MySQL Server for host records and optionally reverse records. At least one of the SELECT statement fields must be filled out, but you can leave some blank if you don't want to use that feature. For forward lookups (name to IP) you need to include a ?hostname parameter in the SELECT statement, and the query must return two columns; IP-address and TTL as the first and second columns. 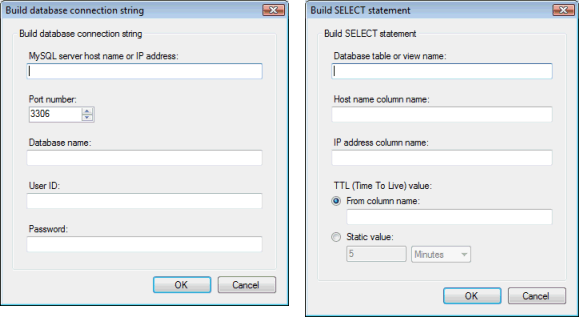 For reverse lookups (IP to name) you need to include a ?ipaddress parameter in the SELECT statement, and the query must return two columns; host-name and TTL as the first and second columns. For either type of lookups (forward/reverse), you may optionally include a ?clientip parameter which will contain the IP address of the client requesting the data. The column names of the returned data do not matter - only the column order. If there are more than one row or more than two columns returned, additional rows and columns are ignored. NOTE: This plug-in is uses the MySQL "Connector/Net 5.0" component v. 5.0.8.1 (included with the plug-in download).